New Year’s Day started very murkily as we had a relatively leisurely pack in readiness for our journey home. After packing and negotiating all the various high-security exits to the apartment complex, Carol and I took a brief stroll around the Dives-sur-Mer harbour development before saying au revoir. We had plenty of time for the journey; Calais was about three hours away and the ferry booking was for 5:30 PM. 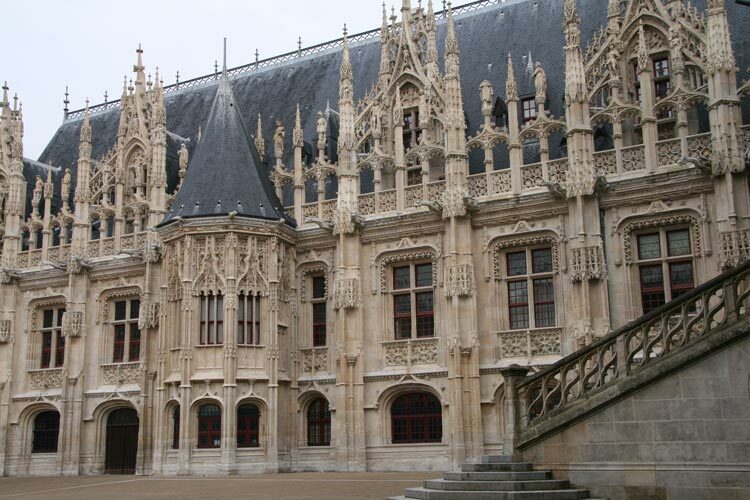 So, we decided to call in to a town that we habitually simply drive through on our longer French journeys: Rouen. This is where the English practiced their early barbecuing skills on Joan of Arc. We arrived just before midday and found somewhere to park fairly close to the centre. 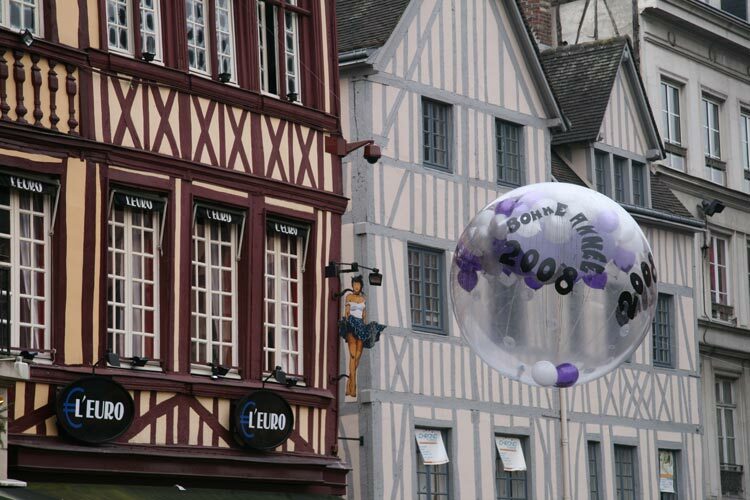 Being New Year’s Day, France was essentially closed for business but there were a few people wandering about. The town was badly damaged during the war and had obviously not been very sympathetically restored. The Cathedrale de Notre Dame and Palais de Justice were magnificent, the latter having largely been painstakingly cleaned of the years of grime. Scattered between the old elegance, however, were concrete monstrosities serving as stark reminders of the architectural follies of the late 1960s, some of these being covered in graffiti and sporting broken windows. One such building appeared to have incorporated and old historic wall into its structure but the joins were everything but seamless and the new swamped the old thus making the token gesture appear totally pointless. Curiosity sated, I think we’ll resume our former straight through approach next time. Continuing our northward thrust toward Calais, the weather deteriorated and became depressingly wet and foggy so there was no point dallying further. We arrived at the ferry port and managed to get on to a crossing departing at 3:50 PM which would make our home time more appealing. We were boarding about 20 minutes after our arrival and managed to get a table in the on board Langan’s Brasserie. Apart from giving Keith and Marlene a comprehensive Channel crossing experience (tunnel out, ferry back), my main reason for using the ferry on New Year’s Day was to eat since I wasn’t sure what else might be open in France; a good decision, as it turned out, since little else was. Naturally, once back on English soil the traffic density shot up alarmingly but we returned home without mishap carrying two prisoners captured from the Normandy Calvados Battalion as a reminder of a splendid trip.